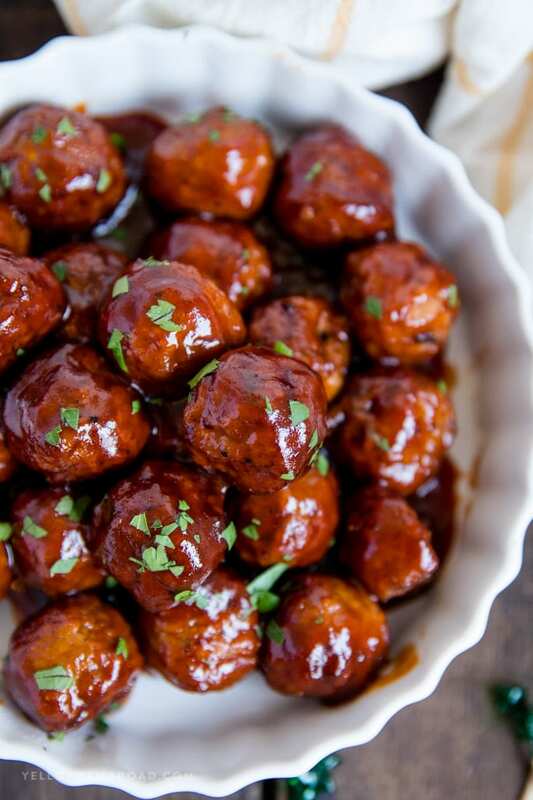 Spicy Barbecue Grape Jelly Meatballs are a classic appetizer that’s been kicked up with spicy barbecue sauce for added heat and flavor. 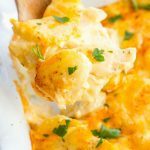 A perfect game day appetizer or delicious as a meal served with a side of rice and veggies. Ok, let’s be real here for a minute. Grape Jelly + Meatballs? Sounds a little out there, I know. But let me tell you, the grape jelly mixes with the spicy barbecue for a sweet and spicy sauce that lovingly coats the meatballs for snacking perfection. 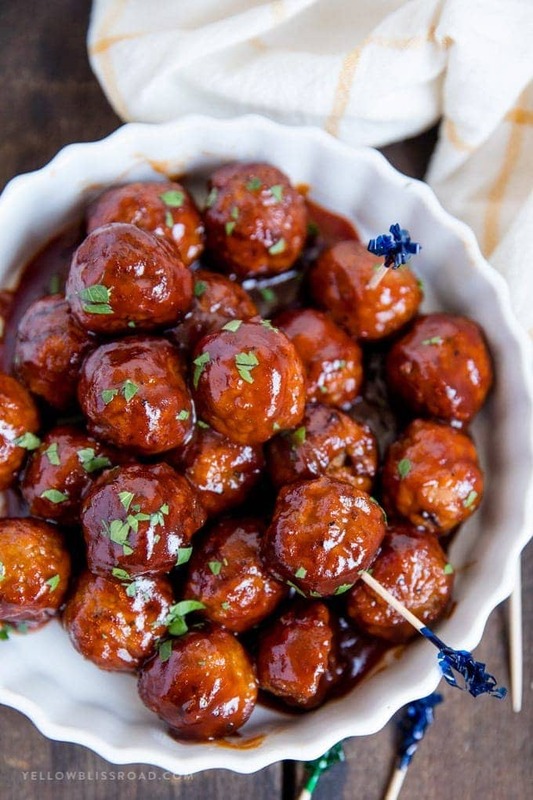 Meatballs are one of my all-time favorite game-day snacks. I say that like I actually participate in game day…I don’t. But I participate in food and if game day means food then I’m totally there. Therefore, game day is my thing. And meatballs are totally a manly, game day kind of food. 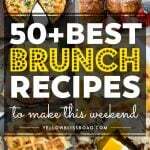 This recipe couldn’t be simpler. There are literally just 4 ingredients, or 3 depending on how spicy you like it. Grape Jelly, Spicy Barbecue Sauce (affiliate link), Red pepper flakes, and meatballs. You could definitely make your own meatballs if that’s your thing. Saving time is my thing so I just use the frozen. And let’s face it, we’re gonna slather it in grape jelly so does it really matter? 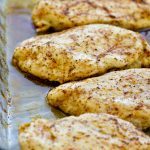 This recipe can easily be made on the stove top in about 20 minutes or less, or you can toss it all in your slow cooker (aff) and let it do the work. 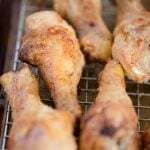 I like to make them on the stove top because it’s so easy and I can use my slow cooker to make some amazing Asian Style Chicken Drumsticks or BBQ Ribs. 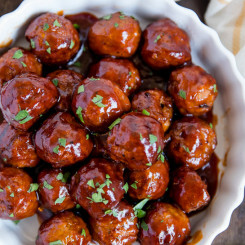 So to make these Spicy Barbecue Grape Jelly Meatballs, combine the barbecue sauce and grape jelly in a medium-sized pan over medium heat. You can toss in some red pepper flakes for even more heat, but that’s totally optional. Whisk the jelly and bbq sauce together until the jelly is melted and the sauce is starting to simmer. You can then add the thawed meatballs and toss them around in the sauce to coat completely. Cover it and let it simmer for several minutes until the meatballs are heated through. Now, my sauce wasn’t thick enough for my liking, so I added a cornstarch slurry to thicken it up. Again, this is totally optional, but it did transform the sauce into more of a glaze, which is what I was really going for. To make a cornstarch slurry, which is used as a thickener for sauces and soups, whisk together equal parts cornstarch and liquid. 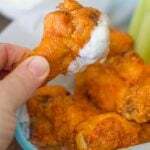 In this case I used about a tablespoon of cornstarch and a tablespoon of water. If you don’t want to add water to whatever you’re thickening, you can add some of the liquid from the recipe. Slowly pour the slurry into the pan and stir. 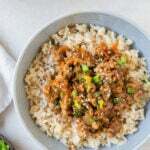 The sauce will react with the cornstarch and begin to thicken almost immediately. Let it simmer for a few minutes, then add more cornstarch if you desire a thicker sauce. 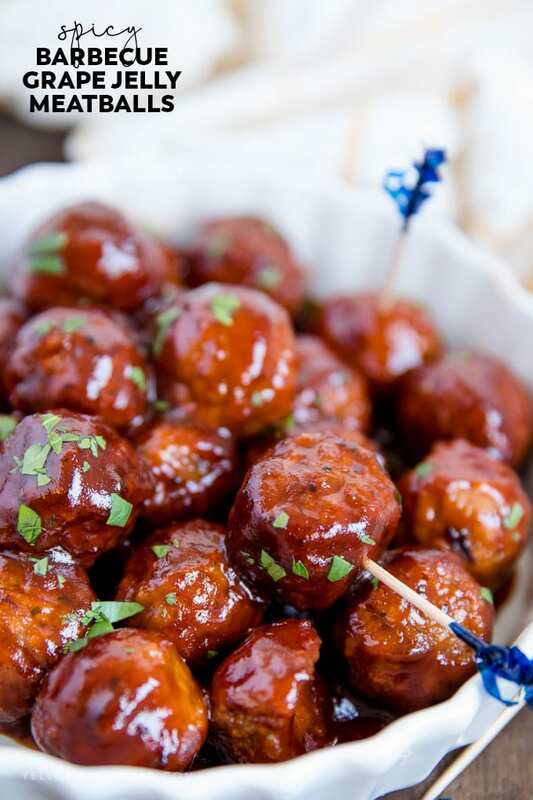 Grape Jelly Meatballs are the perfect appetizer for your next party! 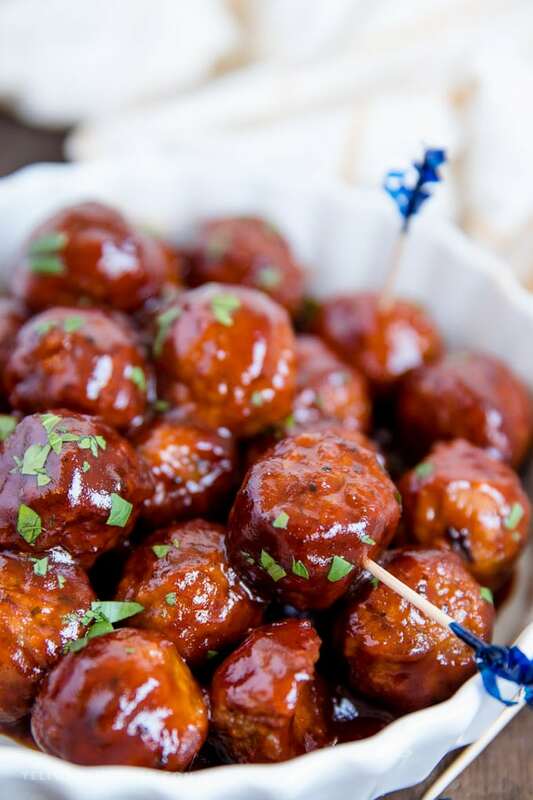 These Spicy Barbecue Grape Jelly Meatballs are a perfect sweet and spicy appetizer for game day or any party. 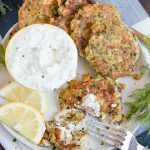 My family enjoys them as a meal too, served with a side of rice and veggies, and my daughter has even been known to be the hit of the playground after requesting them in her thermos for her school lunch. As crazy as they sound, I’ll bet they’ll be the hit of you family’s table too! In a large deep skillet or saute pan over medium heat, combine grape jelly, spicy barbecue sauce and red chili flakes. Cook, stirring often, until bubbly. Stir in frozen meatballs and coat completely with the sauce. Reduce heat to medium-low, cover and cook for about 15 minutes, or until meatballs are heated through. Stir a couple of times to avoid scorching the bottom. 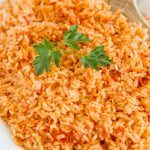 If sauce needs thickening, stir in the cornstarch mixture (slurry) and stir to completely incorporate and until sauce is thickened. Let simmer for a couple of minutes, and add another portion of the slurry if desired. Serve immediately. Garnish with fresh parsley or green onions if desired.